NBC News declared pickleball the fastest growing sport in America four years ago. It still is. More than 2.8 million Americans of all ages wield their paddles on pickleball courts at community rec centers, country clubs, elementary schools, retirement communities, travel resorts, even jails. The game grew in popularity by 12 percent last year. 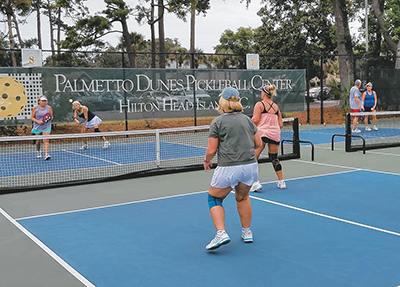 "There's a couple of reasons pickleball is so popular," said John Kerr, director of tennis and pickleball operations at Palmetto Dunes Oceanfront Resort on Hilton Head Island. "The first one is the learning curve. Anybody who has a little bit of hand and eye coordination can really be having fun after 15 or 20 minutes on a pickleball court. 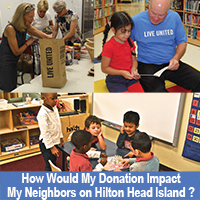 "Another thing, which is a perfect fit for our resort, is it's a multigenerational game," Kerr said. "On an athletic level, there's few things grandparents can do with their grandkids. It's a beautiful thing to see. The entire family can exercise and have fun. Pickleball is fun." Mark Anders, the resort's head pickleball professional, added that the sport is physically demanding as a cardio workout but not grueling on the body like other sports. It is social, competitive, easy to learn and play, fast paced, inexpensive and habit-forming. "It's so addictive," said Chris Gumm, a pickleballer for two years and a part-time resident of the island. "We do it everyday. It gives you a decent workout, and it's a real good social sport. My wife plays, she's a beginner, but she enjoys it too. It's the only sport I can play with my wife." He and his wife, Vanessa, also own property in Stone Harbor, N.J.
"Pickleball in Stone Harbor is off the charts," the 50-year-old said. 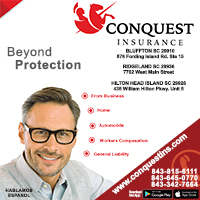 "It's growing in New Jersey, obviously growing at Palmetto Dunes and they're building courts in Florida where we also live. It's quite amazing." Palmetto Dunes has 16 pickleball courts, eight of which opened recently. Every day, year-round, from 10 a.m. until noon, it hosts a round robin tournament for 32 players. The resort hosted the inaugural Ansboury Academy for four days at the end of September that provided 15 hours of instruction, techniques and tactics to participants. The resort hired Sarah Ansboury in June as its pickleball touring professional and director of instruction. 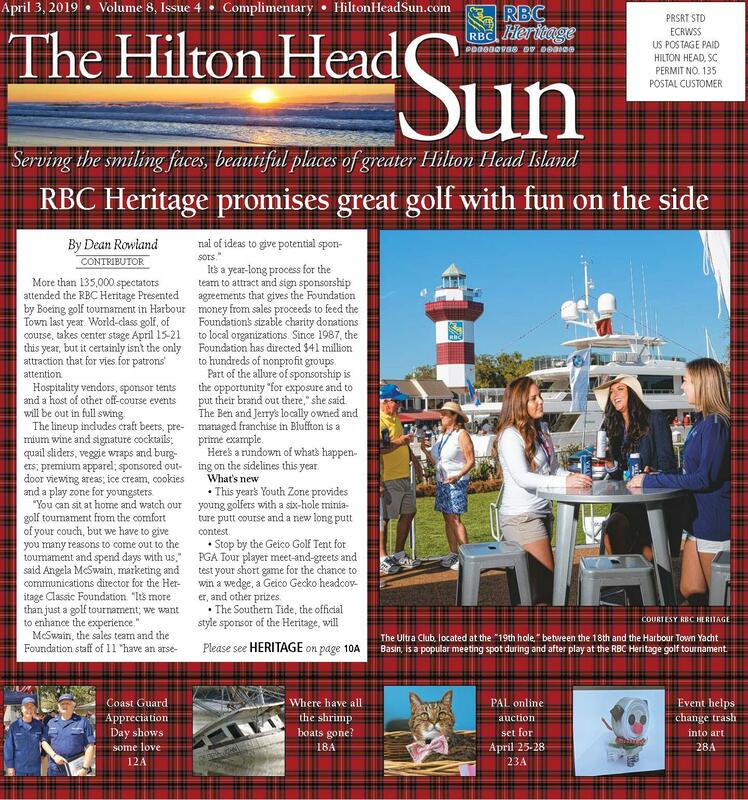 There are three other Hilton Head resorts that offer pickleball too, but the first community to introduce it to the Lowcountry was Sun City Hilton Head (SCHH) in 2005. Thirty residents formed the club and played, using temporary nets in the parking lot at the sales department. The club was formally chartered the next year, and the first permanent courts were installed in 2008, said Rick Wright, board president of the SCHH Pickleball Club. It has a membership of 905 players, half of whom play multiple times a week at the retirement community's 12 courts, eight of which are lighted. Sun City has hosted a national tournament every spring since 2013, with 240 competitors from more than 20 states and Canada participating. The sport, which was founded in 1965 by three dads who creatively invented a game that their families could play together on vacation, mixes elements of tennis, Ping Pong and badminton. One of their dogs was named Pickles, who loved chasing balls and hiding them, hence the name of the game. The sport is played on an asphalt surface with an acrylic coating. Four of the 20-by-44-foot pickleball courts are about the same size of one tennis court. Singles or doubles players use a paddle twice the size of a Ping-Pong paddle, made of wood or a textured composite material, and hit a perforated plastic ball over a 34-inch raised net. In play, all serves are underhand and only the serving team can score a point. Eleven points in a game is the standard for winning. Upon serving, the opponent must let the ball bounce at least once and so must the server upon return from the opponent. After that, the rally is on.